I am a huge fan of creativity tools and this one specifically designed for video game is particularly smashing. 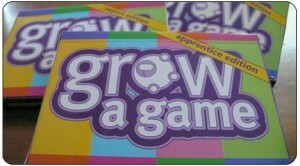 Values@Play’s mantra is ‘designing social values in computer games’ and Grow a Game is a series of cards designed to do just that. There’s even an online version to try out and a slideshow to explain the whole thing. I’m currently using ‘Dancing’ to promote ‘Tolerance’ by modding ‘Flower’ and thereby raising awareness of our ‘loss of biodiversity’. SYNDROME.